Revolution is roaming free over the streets of Egypt. Claiming lives of Egyptian people from different parts of the political spectrum since the toppling of Muslim Brotherhood by Egyptian Army after a series of mass protests, in last July.The Interim Regime and its godfather General Al-Sisi is facing the rage of the Islamists, the supporters of the Muslim Brotherhood and the people who are simply against coup-making. 16th of August was called “Friday of Wrath” because the tensions between sides are very high. The response from international community was mixed. French, German and the UK leaders condemned the violence and called the sides to stop fighting. Moreover, the EU aid to Egypt came on tatters as criticism towards the attitudes of both sides, especially on the Interim Government of Egypt. Barack Obama gave a speech on the issue, in midst of his vacation, calling joint military maneuvers off and mentioning that the US military aid to Egypt might be reviewed. Turkey named Wednesday’s events as a “massacre” and both Egypt and Turkey recalled their ambassadors in respective capitals. Scheduled joint military maneuvers were cancelled. On the other hand, Saudi Arabian King Abdullah stated that he supports the Interim Government and its fight with terrorism. Saudi Arabia supported the ousting of Morsi via the Al-Arabiya network. What happening since the fall of Morsi, shows us the dark side of the Egyptian democracy: lack of tradition. Armed clashes were present between the governmental forces of Hosni Mubarak (who was the long-running president of Egypt resting his power on the army and financial connections of Egyptian economy) and anti-Mubarak demonstrators in Tahrir Square movement in 2011. 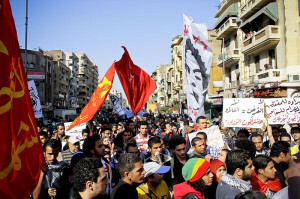 After Mubarak fell the country faced a rather bleak period of transition to democracy. After a referendum in which a new constitution was accepted, Muslim Brotherhood rose to seat of power in the following elections and its candidate for president Mohamed Morsi won as democratically elected leader of the country. What followed soon was Morsi’s disregard for the will of the people who hadn’t voted for him, widespread allegations of corrupt power accumulation in the hands of the Muslim Brotherhood and economic failure. Towards the first anniversary of Morsi’s rise to power, the opposition massed thousands to Tahrir square to protest his “pharaoh like” behaviour. After days of protest, Morsi was toppled by the Egyptian Army under the guidance of General Abdel Fattah el-Sisi. Muslim Brotherhood resisted to coup and started counter demonstrations. Turning violent at times, the demonstrations held by the Morsi supporters showed that the fight for power would not end easily. Different responses to recent massacres were similarly differentiating while the coup was days old. The West seemed to take back its support from Morsi government after a year of failure and Saudi Arabia became a new friend for the Interim Government installed by the Egyptian army. Meanwhile, as close friends of the Morsi government, Turkey and Qatar acted on opposite ends: Turkish government rejected the legitimacy of the coup and rose its voice to support Morsi, while Qatar shifted its discourse from pro-Morsi to pro-Al-Sisi. This was caused by each government’s internal/external political interests. Turkish government was trying to shift domestic support around as it faced unrest beginning with 31st of May. Qatar was passing through a change in the government and priorities. The West was simply not willing to dirty its hands in yet another Middle Eastern Crisis. Civil War in Syria is waging in new fronts as radical islamist rebels are fighting with Kurdish groups in the north and with other rebels in other parts of the country. Interestingly enough, the patterns of alliances over Syria seem to overlap with connections supporting the sides in Egyptian turmoil. This does not mean the conflict in Syria will simply spill over to Egypt, however it means that the larger powerplay for the rule of Middle East has gained another front. Egypt is a traditional core for power since, well… Ancient Egypt, and difference between a powerful Egypt and an Egypt in turmoil will have effects that are miles apart from each other, on the Middle East, the Old World, and the Globe.